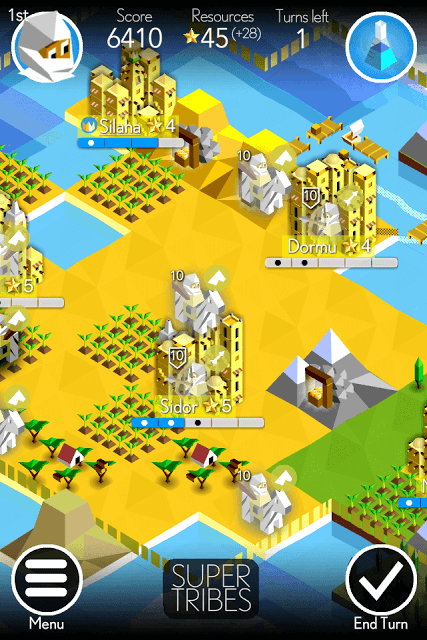 The Battle of Polytopia (Aka Super Tribes) is an excellent turn-based strategy game. It’s more of a simplified, fast-paced version of Civilization where players collect resources, research technologies, explore the world, fight rival tribes and conquer their cities. The game has a pretty stripped-down research tree, and understandably so, given that the game is developed for the impatient mobile gamer. Worlds are randomly generated every time you select a new game. You can also choose the number of opponents and the difficulty level. Your goal is to protect your cities from enemy invasion and score higher than rival tribes. The > sign shows what will be available next after researching a technology. For example, Riding > Roads suggests that researching the Riding technology will unlock Roads. Researching a technology adds 100 or more points to your total score. – Enables the construction of roads. It also activates the Network task – Connect 5 cities to get a market which will add more points to your total score. – Research this technology to build a knight. Knight has 4 Attack. 1 Defense and 3 Movement. – Researching this technology lets you harvest fruit. – Research this technology to build defender. – Research this technology to build a windmill. Construct windmill close to farms. It will produce 1 population for every farm close to it. Only one windmill can be built per city. – With this technology researched, you will be able to climb mountains. – Research this technology to build the Forge. Build it near mines to produce 1 population per mines close to the forge. With this technology researched, you can also build a Swordsman that has 3 Attack, 3 Defense and 1 Movement. – Research this technology to build the mountain temple. Building the mountain temple will grant extra power to your units when they are fighting in mountain. Mountain temple provides 300 points and produces 1 population. – Research this technology to build an attack ship, which has higher stats than a boat. Attack 3, Defense 1, but 0 Health. It will also help you move on ocean tiles. – Research this technology to construct the water temple, you will get 300 points after building it. – research this technology to build sawmill. You will also unlock catapult that has 6 Attack and 3 Range. Building sawmill close to lumber huts produces 1 population for each hut nearby. – With this technology researched, you will be able to construct “Grow Forest” and “Forest Temple”. The temple produces 1 population and has 300 points. If there’s an animal on a forest, then try to choose Hunt first to earn population and then you can either clear forest to get 2 resources or build a lumber hut on it to add another population to a nearby city. Do remember that clearing forest does not cost any resource. Instead it gives two extra resources. If you discover all available technologies, you will get a special structure that will provide bonus points and boost one of your cities. While exploring the world in search of rival tribes and conquering their cities seems to be a good idea, you should also consider conquering villages. This will not only allow you to expand your borders, but also get additional resources (stars) per conquered village. Capturing an unconquered village is a less risky option than attacking an enemy tribe’s city to capture it. Make sure you create a soldier in your newly captured village to protect it and complete tasks available close to it (farming, hunting, fishing, mining etc.). This will not only add some points to your total score, but also add population to your captured village, upgrading it to a city. Every time you upgrade a city, you will be greeted with two bonus rewards. Choose your reward wisely. It all depends on the situation you are in. If you have just started and need an extra resource per turn, then choosing Workshop would be a good choice. Workshop adds one extra resource If you haven’t explored surrounding areas, then you can choose the explore option. This will deploy a scout who will quickly remove the fog from surrounding areas, giving you a clear idea of enemies around your cities or villages. 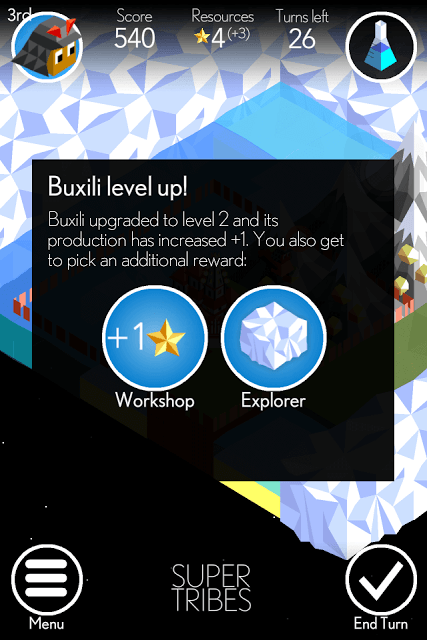 There are also rewards like extra population and extra resources (stars). However, you should not ignore the Super unit reward as it produces a big strong unit with around 40 health points. It also has a great attack rate, but only moves one tile in every turn. I choose workshop or super unit whenever a city upgrade throws such rewards at me. When I am low on resources and if the city upgrade gives a choice between extra resources and another reward, I choose the former because I can spend some more resources to complete actions or research tech without wasting a turn. Resources are used to research technologies, complete tasks such as farming, hunting etc. Every completed research or task adds some points to your total score. Researching technology adds extra points to the total score. Any task you complete adds some points to your total, and also adds population to a nearby city. Once the population meter of a city becomes full, it upgrades to a bigger city. Once your city gets upgraded, resource production will be increased +1. For example, when the game begins, you receive 2 resources per turn. After upgrading a city, an extra resource will be added to the total, making it 3. You will now receive 3 resources soon after ending a turn. Keep capturing small villages and upgrading them to extra more resources in every turn. The objective is to score more than your rival tribes and get to number one position before the turn counter hits zero. Once you have moved all units, don’t hit the “End Turn” button yet. Examine your world, and see if you can complete some tasks or research any new technology with the available resources. Make sure you spend resources to research a technology like fishing if your city has more water tiles than mountain tiles. Examine your world, see what tiles surround your city and unlock a technology that will help you extract stuff from those tiles. Imperius – Starts the game with Organization tech. You can select a tribe of your choice, but choosing the Oumaji tribe will ensure you have the Riding technology already researched. And with that technology researched, you can create a rider at the very start of play. The rider can move two tiles and can be sent to explore and discover/capture small villages. Once you begin playing, examine surrounding tiles. If there are more wild animals around your city, then begin researching hunting. If there are tiles with fishes, start researching fishing. Also, move your unit to explore the world, and don’t forget to create one in your city to protect it. If you have chosen Oumaji, then it would be much easier for you to remove the fog as it moves two tiles per turn.